Bunions are something that most women and female athletes suffer. From a younger age, women wear tighter fitting shoes, like flats, or as you get older, you may wear wedges and/or high-heels. Over many years, this can affect the formation of the arch of the foot and the functionality of the big toe. The big toe is the cornerstone of all foot bones because of its importance with your gait, or how you walk. Having proper big toe extension is critical in athletes in many sports, including basketball, running, and ballet dancing. The big toe allows the deeper muscles of the foot and calf to provide support for your arch and proper coordination of these muscles to properly push-off during this phase of your gait. What is a bunion and how are they treated? 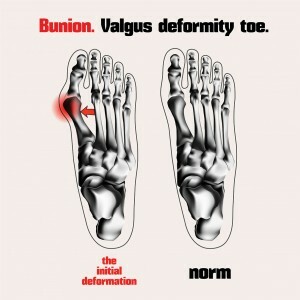 It is important to quickly mention what a bunion is. A bunion usually develops from overuse and repetitive movement. A bunion occurs initially when enough calloused tissue due to pressure and overuse irritates the bursa (water-filled sac near the big toe joint allowing for proper, fluid movement of the big toe [to flex and extend]). Athletes who suffer from bunions and are diagnosed early and properly treated by a sports certified chiropractor, can avoid surgery and missed time away from the sport(s) he/she enjoys. Surgery is helpful in about 50% of bunion cases generally. The other point to bring up is that because bunions are the result of overuse and repetitive movement, they can grow back even if they are surgically repaired. The rehab and recovery process for a bunion process is a pain-staking one, in which one has to wear a walking boot for 10-12 weeks followed by intense physical therapy to learn how to walk again. Sports-certified chiropractors help to reduce bunion formation by adjusting the 1st metatarsal to help improve foot mobility and flexibility. Also, Active Release Techniques is utilized to break down the scar tissue that has formed around the big toe and the muscles that help move the big toe and support the foot/arch. Additionally, Kinesiotape is applied to help relieve any symptoms to support the big toe and finally, rehab exercises are given to strengthen the muscles that are weak contributing to bunion formation and poor arch support. Bunions are complex injuries that can recur throughout one’s life once they are initially diagnosed. It is important to reach out to a sports-certified chiropractor who has knowledge and expertise so you can have the proper treatment and not let this injury affect your ability to play or compete.